Killer Characters: Giveaway! Who Loves Cat Things? Giveaway! Who Loves Cat Things? I bet you are tired of hearing from the “people” who live on Fort Myers Beach. It’s finally time to hear from the one who really knows what goes on. My name is Bow. For a long time I lived, very happily, with Miss Delia Batson on Estero Island in Fort Myers Beach. Miss Delia found me when I was just a little guy living all by myself in Bowditch Point Park. She named me Bow and every day she fastened a pretty ribbon around my neck and tied it in a big fat bow. Get it? Then she would pet my head and open the door, so I could roam free. I never went too far and I always came home again for dinner. And I never, ever, went near Bowditch Point Park again. Well, except for that time with Skully. One of my good friends, Miguel Guerra, chef at the Read ’Em and Eat Café and Bookstore, lives right by Estero Bay, and the mangrove trees in his side yard were a regular stop on my daily walks. He often left a bit of tuna or some delicious nibbles next to the bowl of fresh water he set in the shade for me. When it turned out I couldn’t live with Miss Delia anymore I was sad, and more than a little confused. I felt fortunate indeed that Miguel decided to invite me to live with him. So here I am chasing rabbits, egrets and tree crabs round and round the roots of a half dozen majestic mangroves and at night I sleep at the foot of Miguel’s bed on my very own pillow. Anyway, she calls it a key cap and told Miguel he should put it on his house key so he could always find it, even in the dark. Luckily for me, Miguel left the key cap on the end table. I slipped up on the arm of the couch, grabbed the key cap and hid it in my favorite spot under the China closet. After a while they all stopped looking for it and Luz and Rey had to go back to Orlando before she had a chance to make another one. Now I want it gone for good. For a chance to make this silly image your very own, please comment below by midnight your time on Thursday, February 22nd. Just say anything at all about cats or about me in particular for a chance to win. And remember you can always visit me in the Read ’Em and Eat books: Well Read, Then Dead, Caught Read-Handed and Read to Death. Nice talking to you. I hope they let me come back again sometime soon. Very cute and creative. I presume kitty Bow, was insulted. Well thy say art is beauty is in the eye of the beholder. I have two cats but they belong to my daughter who is in the Peace Corps. My daughter has a tuxedo and would love this. Definitely love cat things as I have 7 of my own. Thanks for the chance to win. My cat has decided he needs my full attention. He has tapped the computer three times. I guess I better give him my attention or there will be consequences for me. I have two cats, Hamilton and Jefferson and love everything cat! I love cats. I have a long haired black cat named Yoda. He is 16 years old. Thanks for the chance to win. Aww this key cap is adorable, even if it doesn't look exactly like Bow. We have two cats one is a calico thee other is her kitten tiger, thee momma cat adopted us, she one day came to our doorstep, and has been there to this day, they both are the sweetest cats, so well deserved! We love cat things. And finally I have Caught Read Handed coming. I have a fairly new girl. Her name is Pesky. She is the type of cat the term "scardy cat" was coined for. Any sudden move or loud noise and she is GONE. I sneeze? She's gone. And will slowly peak around the corner of the door to see if it is safe to come back. I am between laughing. And being irritated with the silly thing. But would not trade my cuddle buddy for anything. Now her brother? Twice her size. And so laid back. They take turns terrorizing each other. He starts it? She screams her head off. You can hear her down the block. She starts it? You don't hear a sound. She is a talker. He? is very quiet. Have had them for almost 3 years now. Della at deepotter at peoplepc dot com. Bow sounds sweet! 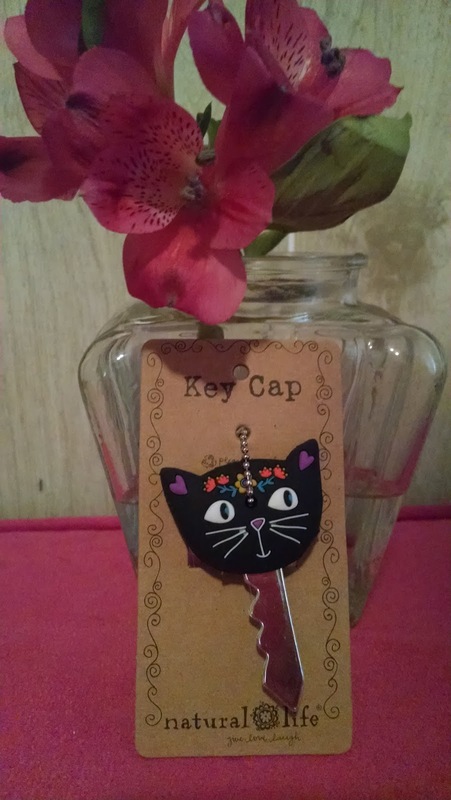 The key cap is adorable.I love all things cats! I only have 2 at the moment. Noah and Penny. The sweetest kittys. I need them more than they could know. Now I would love that key cap because I have a cat, Honor Blackcat, that also was a "street" rescue. Love anything that shows black Cats in a positive light. Thanks for the opportunity to win this lovely item & make Bow happy that it is gone for good. I seem to collect strays or rather they collect me. I think the key cap is cute. Bow you sound like my two cats, Tigger and Princess. I miss them so much. I had to give them up when I had to move out of my house. That key cap is adorable! Perhaps it doesn't like like you, but it is still cute. I always like reading about your adventures, Bow. Thank you for the chance to win! Bow, you sound adorable! And I have to say that key cap looks cute too! Thank you for the chance. Cats are my favorite! Loved the story. What a lucky guy! Two wonderful people have loved you. And now you live with a chef, and have your own bed, and mangrove trees to have fun with. Sound heavenly! I don't own a cat, I have 2 dogs, but my daughter has 8. She has lupus and is pretty much house bound so I go down every day to help her and her cats come running to meet me and be petted and talked to. She did a wonderful job of Key Cap Bow's eyes! I love cat eyes. My siamese wanna-be kitties have beautiful blue eyes. And the dog thinks he is a cat too. The key top is so cute. My daughter has a cat that doesn't like to cuddle. Her hobby is sleeping and begging for food.